Matthew McCullough of Ambient Ideas co-presented with me on JavaFX Script at the Boulder Java Users Group last evening. 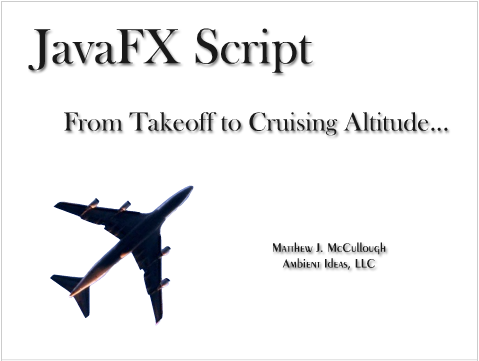 Matthew's JavaFX Script presentation makes a great case for developing rich internet applications in JavaFX Script. It discusses JRE deployment improvements as well. His presentation also set the stage for me to dive right into code during my part of the presentation. Mine was a subset of a JavaFX Script presentation that I delivered at JavaPolis a couple of months ago. By the way, we're going to do the same presentation tonight (Feb 13, 2008) at the Denver Java Users Group meeting, so if you're in the Denver area, please stop by!